Learning to read, and other things. It seems like good ol’ Winnie and my boys have something in common. My oldest son is in his final months of kindergarten and even as I type that my eyes get a little misty. Somehow five years have managed to blink by. I remember the day that I found out I was pregnant with him. I remember the day that I first felt the little flutter of life inside of me. I remember his pink, newborn body lying on my chest for hours as he slept and I just breathed in the scent of him. He steadfastly took to his role as “eldest” at fifteen months old and assumed an “I do it!” attitude. His perseverance and tenacity continue to amaze me. I have had to train myself to step back and let him make his mistakes, so that he can learn. As my son struggles to fold over and tighten the loops of his laces, I struggle to keep my hands in my pockets and encourage him with my words. We’re both learning. He is learning to be independent and I am learning to let him. With grade one on the horizon, my son’s new goal is to read a book to his kindergarten classmates on his next Special Helper Day. 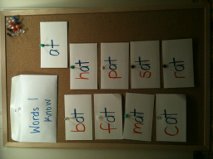 To help boost his confidence and improve his ability, together we created a weekly Word Wall. Each week we pick a different “word family” and print the words onto cue cards. He then pins the cards to a bulletin board and we read them over a few times each day. Over the past month I have been amazed by, not only his progress but, his diligence. Last night, as we lay together on his bed, he read his first book to me. He stumbled on some words but I was there to help him sound them out. He linked the syllables together and formed words and I was there to see his toothy smile spread across his face. When we finished the book, he looked over at me and I was there to receive his high-five. While my son is learning to link letters and decipher words, I am learning that teaching him to read is really a metaphor for parenting. Be there to help him when he stumbles. Be there to help him sound it out. Be there to support him when it’s unfamiliar. Be his biggest cheerleader, always ready for a high-five. I can so relate to this! I work with Angel #1 every night on her reading and she’s in Grade 2. We have now moved on to chapter books. Exciting times!! Nice new layout of website BTW, very clean. Thanks, Vanessa. I really hope that they develop a love for reading. We have started reading the Flat Stanley series. The boys cuddle in bed with me and we read about his adventures. They think the story is funny – and we have fun predicting what comes next. Any suggestions for other beginner chapter books that we can read aloud together? Weepy!! What was the book? Griffin’s first was Margaret Atwood’s Up in a Tree, a great beginner reader book. The Elephant and Piggie books can’t be beat, either. It was Fat Cat. The book is nothing exceptional but seeing how proud he was after he read . . . THAT was exceptional! Well. That made me weepy. It’s hard to watch them struggle to do something you could do 100 times faster, but the reward of their pride in the accomplishment is everything. That was lovely.